It’s good luck. I swear! I studied French for about 8 years total in middle school, high school, and college. I don’t speak French, or understand French when other people speak it, but I used to be able to read and write and French, and I did make a pretty decent effort to learn it for eight years. Pretty early on in my studies, I was taught the word rosace, which translates to “rose window.” As a child, I found it perplexing that I was being taught to say in French a word that I didn’t know in English. Now I know what a rose window is, although, with the exception of possibly one or two cathedral tours in Europe, I’ve never had the opportunity to use it. A rose window is a type of mandala, of course, a large, expensive, and easily breakable mandala. But this isn’t a rose window. It’s a shamrock window. Less costly, more durable. Today I sent out the comics books for which people have paid, so if you bought a comic from me, you should expect it Thursday. Then the Fox took me out for sushi and to the see the National Live Theater Frankenstein with Benedict Cumberbatch, which is a really smashing bit of acting and highly recommended if you have the chance. This entry was posted in mandala and tagged comics, green, mandala, rosace, rose window on November 1, 2016 by littledragonblue. There’s plenty of room for this colorful rainbow mandala in your happy Tuesday, is there not? I am a little ray of sunshine. Love the colors in this one, and the rosace quality of the mandala itself. Without making an effort to wear my crayons down equally, I would most likely compose all drawings as rainbows, or in shades of blue. I do try to explore the full chromatic spectrum, but it takes work, especially when exploring oranges and yellows and neutrals, to which I am not at all drawn. This is one of the mandalas that might get turned into a T-shirt in the future. And speaking of T-shirts, if you would like to purchase a fine one, RedBubble is still offering a site-wide sale on shirts until midnight tonight. Just visit the QWERTYvsDvorak RedBubble shop, select any of our exquisite merchandise, and use coupon code RBTEES15. 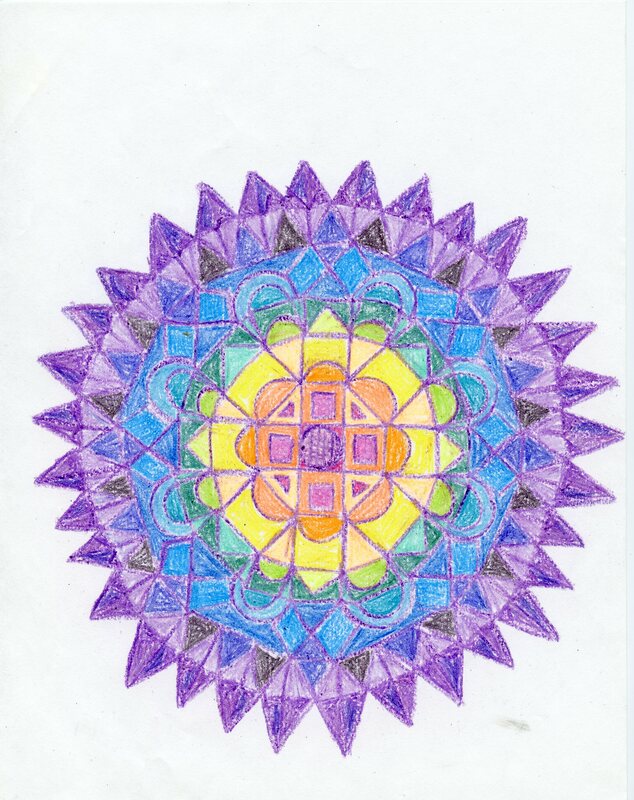 This entry was posted in mandalas and tagged crayon, mandala, rainbow, rosace, rose window, spectrum, symmetry on October 14, 2014 by littledragonblue.